Quercetin is a flavonol from the flavonoid family of phenolic compounds that give flowers, fruits and vegetables their colour. Foods rich in quercetin include tea, apples, red and white onions, as well as red wine, broccoli, citrus fruit and red/black fruit (elderberry, cranberries, blueberries …). ¤ However, not all sources of quercetin are the same, the seed pods of a Brazilian tree, Dimorphanda mollis, part of the legume family, being the only source to date with “GRAS” status - Generally Recognized As Safe by the FDA, in November 2010. This form (QU995™) contains 99.5% anhydrous quercetin of exceptional purity (guaranteed free from heavy metals) due to exclusive methods of extraction and purification, and with excellent bioavailability and a longer half-life. Peak plasma concentrations generally survive for between 5 and 8 hours following absorption, with significant levels still seen after 24-36 hours. Despite the numerous studies conducted on quercetin, not all its properties have been comprehensively listed. However, the body of research carried out so far highlights the remarkable benefits to be gained from supplementing with quercetin. Like all flavonoids, quercetin strengthens the capillary wall and other small blood vessels by reducing their permeability, and also has antioxidant properties. It is thus a valuable weapon against the ever-present oxidative stress. 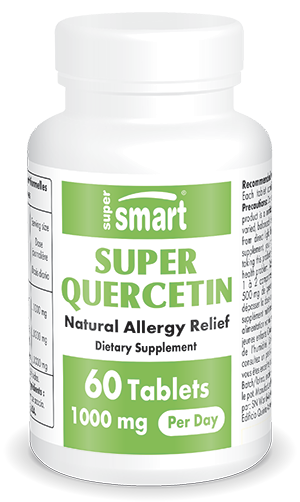 Quercetin protects against seasonal and other allergies: asthma, sneezing, itching, hayfever, eczema, urticaria and allergic rhinitis. A number of studies have demonstrated quercetin’s efficacy in stabilising mastocyte membranes which are responsible for releasing histamine. Thus by reducing cell degranulation, it acts directly on the source of the allergic reaction and its associated symptoms. At daily doses of at least 1000mg spread over the day, quercetin has powerful anti-inflammatory benefits, principally through its inhibition of the NF-kappaB pathway, a protein with a key role in regulating the expression of genes encoding pro-inflammatory cytokines. Its clearest effects have been in chronic inflammation of the prostate or urinary tract (interstitial cystitis). One double-blind study suggested that taking quercetin could significantly relieve symptoms associated with chronic prostatitis, a condition that can be caused by a bacterial infection and sometimes becomes chronic in certain men. In this research, 15 men with non-bacterial chronic prostatitis took 500mg of quercetin twice a day. After a month, two thirds had noted a reduction in pain of at least 25%, while only a fifth of the control group experienced such relief. Quercetin has also been reported to be effective at relieving arthritis pain, acting within just two or three days when administered at a minimum dose of 750mg a day. Human studies conducted in Finland have highlighted the benefits of quercetin supplementation in preventing coronary problems and reducing incidence of stroke. In animals, in vitro tests showed a protective effect against cardiovascular disease while clinical studies have also confirmed its hypotensive effects. In addition, it lowers LDL-cholesterol levels in overweight subjects and inhibits the platelet aggregation involved in the development of atherosclerosis. American and Finnish studies suggest that quercetin has specific properties capable of inhibiting pancreatic and liver cancer by stimulating apoptosis of cancerous cells. In addition, the American Cancer Society reported on a human study in which a combination of quercetin and curcumin reduced the size and number of rectal tumours. Other ongoing studies on animals will hopefully confirm whether these anti-cancer properties are likely to extend to other forms of the disease. In Russia, quercetin is considered a major anti-ageing substance - it is actually called « Russian Rejuvenator ». It may have an effect on longevity by, on the one hand, reducing the impact of certain chronic diseases, and on the other, having a direct effect on life expectancy, at least in experimental organisms, as many studies have demonstrated. Portuguese research concluded that in culture, it was possible to increase the life expectancy of yeast cells by 60%, while a team of German biologists showed that feeding a flavonoid-rich diet including quercetin to the ver C. elegans worm improved its health and overall longevity, most probably by activating a set of four specific genes. Other researchers have suggested that, like resveratrol, it may mimic some of effects on life expectancy of calorie restriction. Oxidative stress, inflammation and immune dysfunction are all increased considerably by prolonged exercise. Supplementing with quercetin can help limit the negative effects of physical exercise by lowering markers of inflammation and oxidative stress. Double-blind studies conducted on cyclists completing a 30 kilometre mountain time trial showed that quercetin supplementation over a three week-period improved their times by around 3.1%, a significant improvement given that results of this magnitude are normally only achievable through taking drugs, or by athletes living at high altitudes. Another study showed that 1000 mg quercetin supplementation a day over two weeks improved performance in against-the-clock treadmill tests by 2.9%. Quercetin also helps reduce the incidence of respiratory infections (the cold or ‘flu virus for example) which can be contracted following intense physical exercise. Quercetin is often combined with ascorbic acid (vitamin C) - it enhances the latter’s effects by increasing its absorption and delaying its elimination from the body. Quercetin and vitamin C protect and regenerate each other. Similarly, bromelain increases quercetin’s efficacy and it can therefore be a good idea to combine them. An exhaustive review of studies has shown no toxicity or carcinogenicity for quercetin, nor any harmful effect on development or reproduction. However, as quercetin can modify the bioavailability of “cyclosporine”, an immunosuppressant drug used to prevent rejection of transplanted organs, it should not be used in such cases. The effects of quercetin can also be boosted by combining it with other antioxidants including vitamin C or other anti-inflammatories such as bromelain. Anyone receiving immune-suppressant therapy should seek medical advice before taking quercetin as it can interfere with certain drugs such as cyclosporin. Adults. Take 1 to 2 tablets a day, as required or as advised by your therapist. Each tablet contains 500 mg of quercetin QU995™.